A lot has been written in facilities publications lately about the importance of workspaces, how they are evolving and current trends. Peruse any FM website or magazine and you’re likely to read about how an improved workplace experience can increase employee satisfaction and productivity. 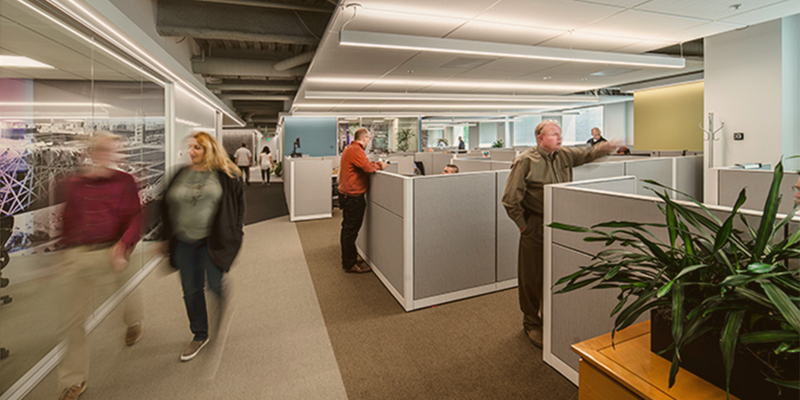 One evolving trend is the “open office” concept. These spaces, popular since the early 2000’s, were initially rolled out as a truly open office (no walls, dividers, etc. 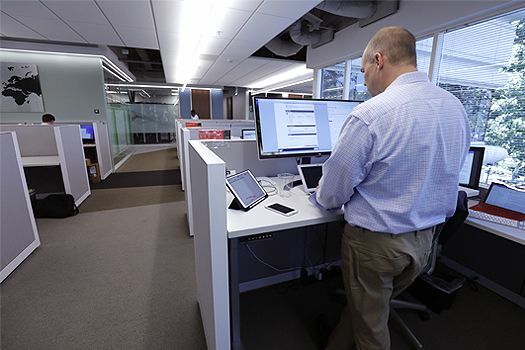 ), where employees were encouraged to work from home if they needed privacy or quiet. While that concept is still being incorporated into today’s office design, the direction now is to bring all the talent back together under one roof. This change was brought about after employers realized face-to-face interaction leads to more creative collaboration and productivity. To accommodate everyone being together in an open workspace, the course has changed to include space for privacy and quiet. In fact, SKYSITE is an example of successful implementation of this modified open workspace concept. We recently moved to a space that incorporates several of today’s trends for improving teamwork, comfort and productivity. However, it wasn’t a straightforward project. Relocating offices and designing a space that works for everyone proved to be a complicated and challenging undertaking. Considering the needs of the company as a whole, divisions within, and specific individuals requires impeccable organization and attention to detail. Our move was even more complicated because we were combining two locations with different office cultures. Located in Silicon Valley, the previous spaces were both traditional, functional offices, however, very different. One facility had an unfriendly, segmented layout that discouraged casual interaction and team collaboration. Staff was located on two different sides of the floor, separated by a large space that included a demo room and conference room, creating separation and isolation. The poor layout of the facility hindered organic communication and the comradery of the full SKYSITE team. The second location, also traditional, with offices, high-walled cubicles and a couple conference rooms, had long since run out of space. While this was due to the company’s growth and success over the last few years, employees were sharing small offices, which forced communication, but didn’t spark creative collaboration. Adding to the issue was a choppy layout that kept groups isolated from easy interaction with each other. These factors, plus the approximately 50-mile distance between the two locations, made the decision to relocate easy. Once the decision was made to combine and move offices, it was clear to our CEO, Suri Suriyakumar, that this would be an opportunity to not only bring two disparate offices together, but to create a environment that would facilitate progressive and collaborative work. Suri’s goal was to inspire creativity and synergy, while creating a comfortable, flexible and inspirational space. Starting with the location, care was taken to choose a site where people would want to be. Every aspect of the location, building and property management was vetted. 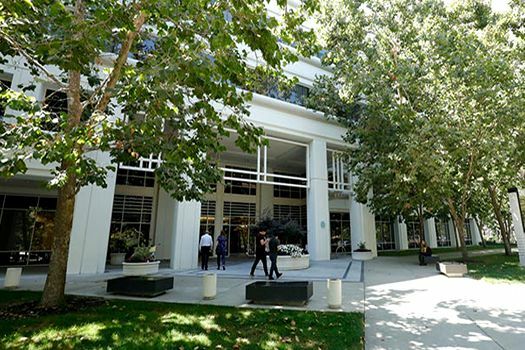 Our new location was chosen partly for being in the middle between the two-previous offices, but also for its conveniences and a relaxing park-like setting. While the business park provides the standard amenities; meeting facilities, food trucks, security, it also provides several specialty amenities designed to reduce stress and improve comfort. 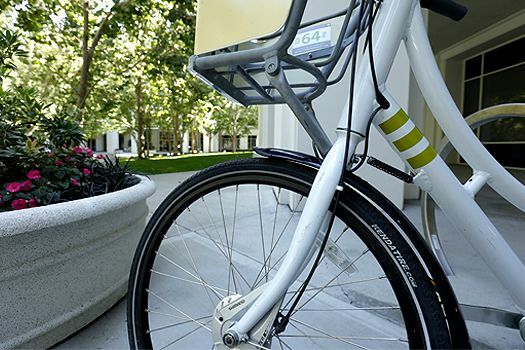 These luxuries include friendly commuter programs, lakeside dining, healthy eating options, a bike share program, and even gas delivered to your car while you work. Once the physical location was chosen, it was time to concentrate on the interior space. Beginning with the question of how employee workspaces would be configured; by function, by previous location, by division, the team began to plan the new space. Meeting rooms, common areas and private phone rooms, as well as often overlooked areas such as storage, were also thought out and planned. The space we selected had terrific natural light provided by large windows that outlined the floor. To make the best use of the exterior windows, it was decided all employee workspaces would be on the perimeter, while conference rooms, meeting areas, phone rooms, etc., were placed more to the center of the design. Our new HQ was beginning to materialize; the vision becoming a reality. be visually appealing and energetic. What emerged is an open space that stimulates conversation, yet provides privacy when needed. From the moment you walk in, you understand that this is meant to be a collaborative, creative environment. While the open floor plan didn’t appeal to many employees at first, the team hit a home run with workspaces that check all the right boxes. After much research into productive environments and feedback as to what staff needed, our workspaces turned out to be far from ordinary cubicles. The shorter height of the cube walls encourages easy conversation and provides lots of natural light while the soft sides dampen sound and still allow for privacy. The desk set-ups are ergonomic and feature motorized stand-up desks. The staff was grouped by function, mixing the two offices to foster interaction. This better integrated complimentary groups (i.e. sales & marketing) for more effective collaboration and brainstorming. The executive team is also in open cubicles, providing easy access and interaction that has already proved beneficial. The open floor plan extended to collaboration areas. Comfortable seating that can accommodate groups of two to ten are sprinkled around the space for easy conversations. However, with so much openness, it was important to ensure plenty of private areas to be free from distractions during meetings and phone conversations. No fewer than 14 conference, meeting and phone rooms, with varying seating arrangements, are strategically placed so everyone has easy access to a private space when needed. To aid in brainstorming and collaboration, conference rooms are equipped with SKYSITE SmartScreens, state of the art call terminals, and full wall white boards. 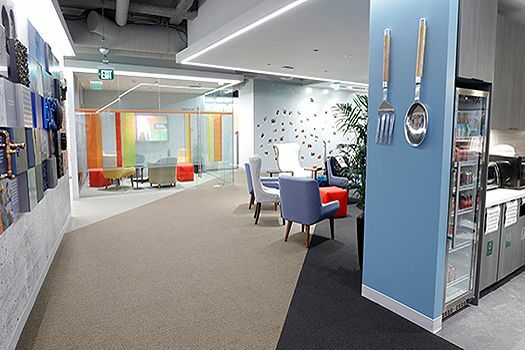 More than just workspaces, the marketing team designed a space that tells a story. Viewing the entire space as an artist’s canvas, they incorporated imagery from our industry into every area. From naming and decorating conference rooms after notable buildings, to unique imagery representing construction workers, facility managers and other building industry professionals, to a building inspiration wall that depicts how we are influenced by structures and how they touch us. The story of our company, our industry and our team is everywhere. Lastly, they made sure we were comfortable and could have some fun. An open kitchen and dining area and a smaller “café” area ensure there is room to congregate to talk about work or something else. A training area doubles as a video game den, and is currently our ping-pong tournament space. Change isn’t always easy, but by incorporating what’s meaningful in our work life, telling a story and providing room to laugh, we can now be included in the lexicon of successful office moves. In the short time that we have been in our new office space, we already see the benefits. We collaborate face-to-face regularly now and have gotten to know each other far better than before. This has strengthened teams, built trusting relationships and increased team work. It has also provided the executive staff more opportunities to be involved, not only with projects, but with people.